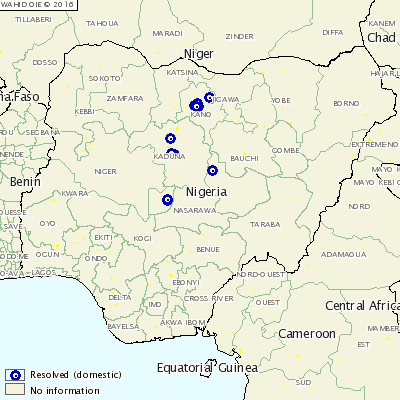 NIGERIA - A further 11 outbreaks of Highly pathogenic avian influenza (HPAI) have been reported in central and northern Nigeria. The outbreaks have affected layers, broilers, pullets, cockerel, geese, turkeys, guinea fowl and ducks on 11 farms in the Kaduna, Kano, Plateau, and Federal Capital Territory. In total, 3,598 cases were reported and 41,183 birds were destroyed as a result of the outbreaks. Although the source of the outbreak is unknown, poor farm biosecurity is thought to have contributed to the introduction of the disease.